Early Access Release StarMade is a minecraft inspired 3D sandbox cube Space Shooter. Explore infinite space in all directions. Explore distant planets and ancient space stations. Gather resources, or go on epic adventures. Design the ship of your dreams, from famous ships featured in movies, book lore and other sci-fi/fantasy cannon. Or design something from your own imagination, connecting modules of ships together and challenging your efficiency and design skills. Do you create a ship that kills and destroys everything or a peaceful trading ship that is really just a smugglers ship in disguise?! Create customized weapons, harvesting, repair, shield and other modules by grouping them into geometrical patterns to increase their abilities. With more modules being dreamed up by the StarMade team EVERY DAY, the possibilities are endless! Economy: Harvest and sell valuable resources you find in distant parts of the universe. Artificial Intelligence: Build your own ships and equip them with an AI. You can also fight your own creations. 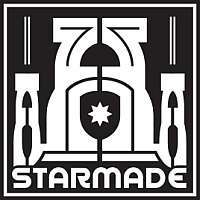 Starmade was designed around multiplayer to begin with. Share control of your super massive ship, design a station with friends or conquer the universe INCLUDING your pals, one sector at a time! This game runs with Java and is OPTIMIZED to run as efficiently as possible.